October is a beautiful month. It’s still close enough to summer that the daylight lingers a little into the evening but close enough to Winter that the sun has a softness about it that adds an extra touch of romance to settings like this one. When we set out, the rain had just settled meaning everything was looking very lush. It was about a mile walk to the first shoot location - as is often the case, the best looking locations are unfortunately not always the easiest to get to! Especially, when you’re loaded down with outfits, camera gear and all sorts of props like an antique table, flowers, food, big blankets and a very lovely (but very breakable) tea set (with thanks to Hira's aunty!). Thankfully, we made it without any catastrophes! The theme of the first part of the photoshoot was ‘Afternoon Tea in the Forest’. Just like me, Hira is a big fan of all things girly so I was in my absolute element in this elegant set-up of lilac and purples, with all the beautiful fresh flowers and the china tea set contrasting with the earthy tones of the forest. I also happen to be a bit of a dab-hand at calligraphy, so I took the opportunity to create some name places for Hira and Hashim to add that extra personalised touch to the set-up. 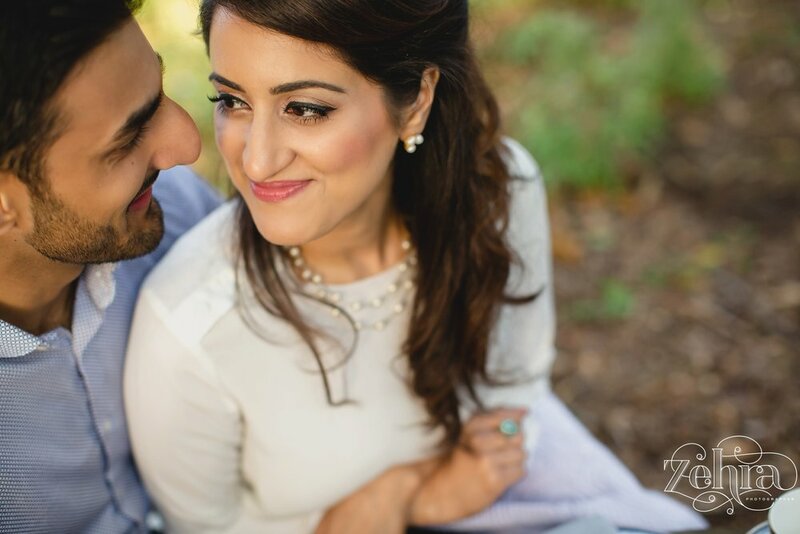 For the second chapter of Hira and Hashim’s photoshoot, we’d be heading out of the woods and towards Trentham Estate’s manicured gardens, where Jane Austen fan, Hira, could enjoy this grand setting alongside her very own Mr Darcy.